On Wednesday, March 6, 2019, the college held its ninth annual Student Research Symposium. 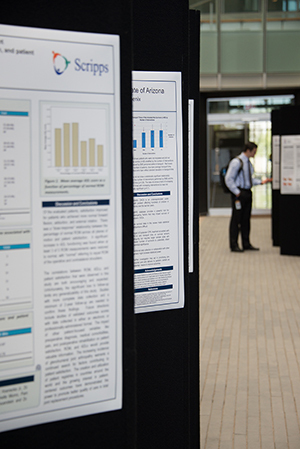 The event highlighted the completion of the Scholarly Projects of our fourth-year medical students. At the symposium, students presented their Scholarly Projects through poster and slide presentations. Last year, they were also privileged to hear distinguished professor Bentley J. Bobrow, MD, medical director for the Arizona Department of Health Services’ Bureau of EMS and Trauma System and associate director of the Arizona Emergency Medicine Research Center – Phoenix, deliver his keynote presentation, "EMS Research: Why You SHOULD Care." Taylor Cushman – Anti-GITR with Radiotherapy Enhances Anti-tumor Abscopal Effects in Anti-PD1 Resistant Murine Model. Tanner Heckle – Maternal and Neonatal Outcomes of Attempted VBACs for Planned Home Births versus Planned Hospital Births. Juliana Liang – Implicit Bias Toward Cervical Cancer: Provider and Training Differences. Puneet Raman – Palmitate Induces Glycosylation of Cyclooxygenase-2 in Primary Human Vascular Smooth Muscle Cells. Mentor: Rayna J. Gonzales, PhD. Mounica Rao – Salvage Gemcitabine and Docetaxel Combination Chemotherapy After BCG Failure in Non-Muscle Invasive Bladder Cancer Patients.